This super holiday apartment is duplex in design over ground floor and basement floors.You enter this modern spacious fully air-conditioned apartment in the open plan living room/ dining/ kitchen. The lounge is furnished with a sofa bed, coffee table, 2 comfy chairs, marble dining table with 6 chairs and has 1 large sea/beach & garden facing balcony. The fully fitted kitchen is ideal for self catering with a 4 burner hob, cooker, toaster, kettle, dishwasher, fridgefreezer and all your utensils. On the entrance floor you also have bedroom 1 which has a double sofa bed, there is also shower room/wc on this floor. The apartment is air-conditioned throughout. It is non-smoking but thier is 1 large balcony and garden access where you can smoke if you wish. The onsite pool is open from 10am - 7pm (May-mid Oct), their are plenty of sun loungers available and a small kiddies pool. The beach at the front of the complex has sun loungers and umbrellas available for a small charge. From your balcony you can be bathing in the warm Aegean Sea within 1 minute! An early morning swim is a pure pleasure. Calis has a small sand and shingle beach suitable for family use. The regions surf and water sports school and club is just a 10 min walk along the beach and caters for all skill levels and ages. To make the most of your holiday you need the best location possible. One that offers privacy but easy access to tourist facilities and nightlife, beaches and amenities. 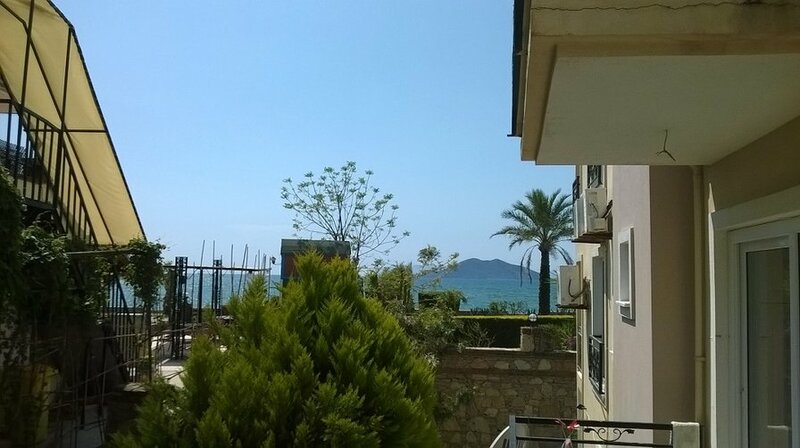 Sunset A5 has a superb beachfront location in the centre of the tourist resort of Calis making it the perfect holiday base. Tourist facilities on your doorstep include bars, restaurants, shops, bazaars, all water sports and wide selection of daily excursions. The historic harbour town of Fethiye is just 4km away and can be reached by public transport, on foot, or bike via the seafront pedestrian promenade at the front of the complex. There is also a water taxi service from Calis across the beautiful island strewn bay to Fethiye. The famous blue lagoon at Oludeniz is just 10km and can be easily reached by public transport, taxi or by hiring a car. Simply put the apartments location has something to offer everyone. Calis is also just a 45min drive from Dalaman internation airport which is open all year.